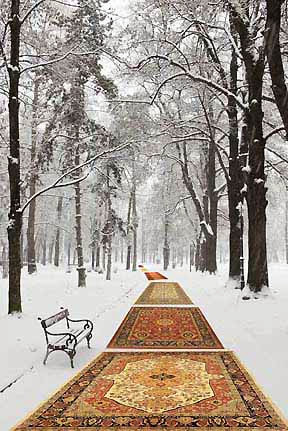 If you are looking for a great way to prepare for the chill; a way to insure that the rooms of your home will welcome and warmly embrace you, the path is clearly marked with REAL hand-knotted oriental rugs. Our customers recently completed renovation of a townhome in Doylestown. An expansive addition to the back of the house permitted new uses for the rooms in front. 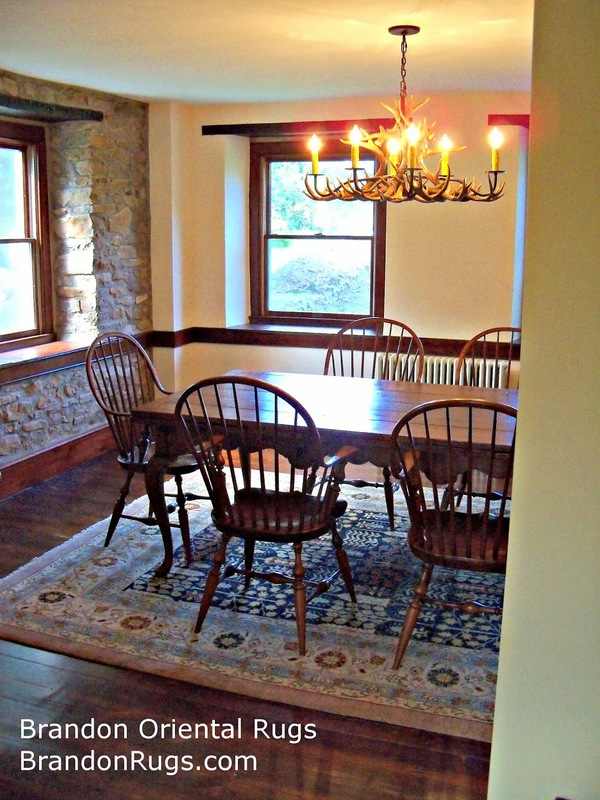 A small dining room in the original floorplan was converted into a study in the "new" home. Our customers had purchased several comfortable leather reading chairs from a local furniture store; had a nice collection of antique furnishings, and asked us to find a rug to make everything work. After installing bookshelves, the remaining space in the room was small, and approximately square. A "shape" rug seemed appropriate, but a square would look forced and actually be too large to work. 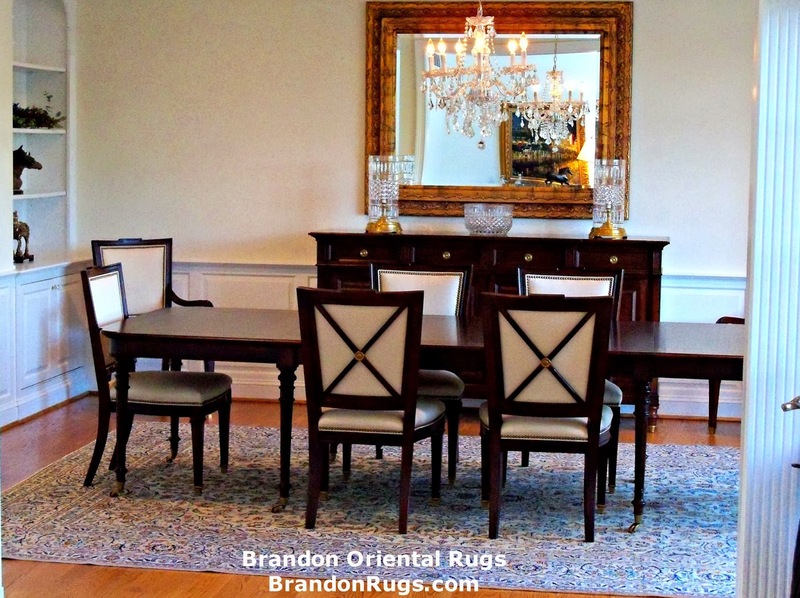 Using our Rug-Search(tm) service, we were able to locate several round and octagonal rugs for consideration. 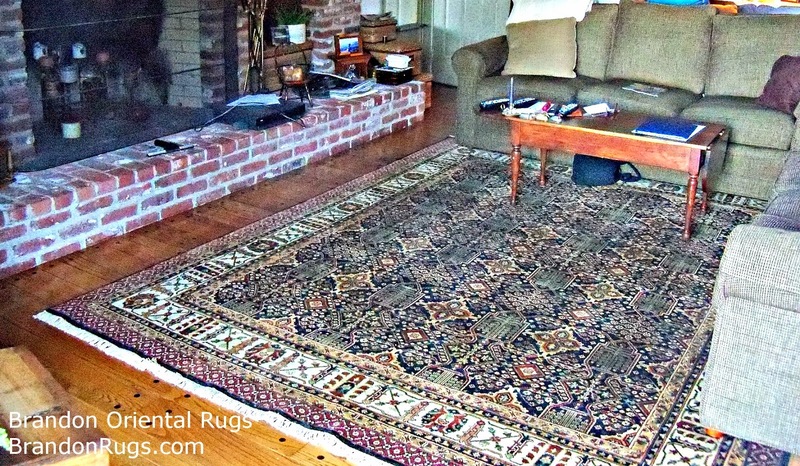 The homeowners loved the idea and look of an octagonal rug, and selected the one shown here. It does a nice job of making the small room look bigger, and allowed the customers to use many of their antique furnishings without clutter, or interruption of the walkway through the room. 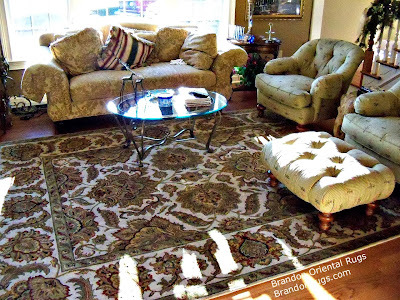 Bucks County Oriental Rug Store Brandon Oriental Rugs - www.BrandonRugs.com - Helps Customer In Newtown, PA Searching for a Handmade Area Rug for a Family Room Find "Love At First Sight"
Our customer furnished this entire room (which functions as a small family room) herself. 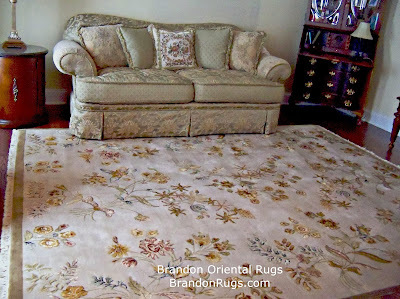 Her family had been living without a rug on the floor for about a year, when they visited Brandon Oriental Rugs, saw this rug in our inventory, and fell in love with it. Not having seen the room ourselves, we offered to bring other choices as well, but were told, "No need to bring anything else. Without question, this is it." When we made the delivery to install the rug for its in-home trial, all could instantly appreciate how successful the rug is in this room. 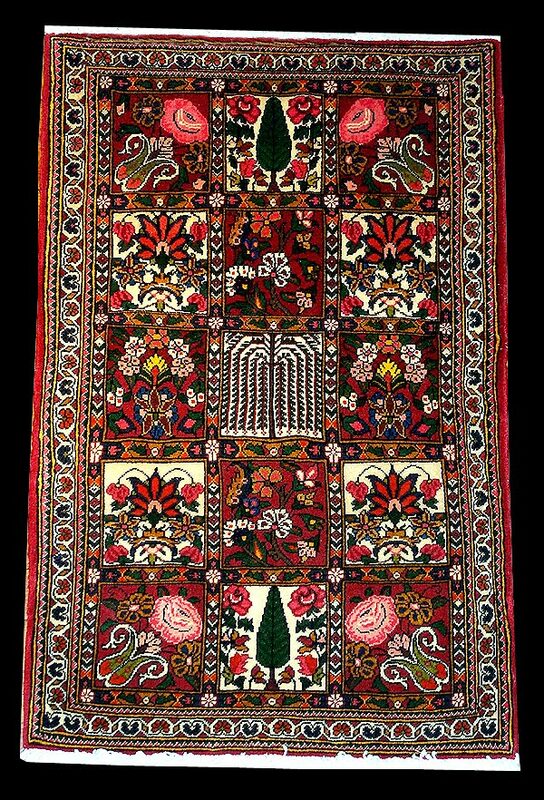 This is an 8x10 Indian Agra design rug. The light backgound and non-contrasting light border of the rug visually expand the room; the large scale pattern is non-competitive with the small floral patterning of the fabrics; the transitional styling of the rug is appropriate for the relaxed look and function of the room. We often point out to our customers that there is a kind of marriage between a handmade oriental rug and its environment. Sometimes, as here, it's love at first sight. Sometimes the perfect mate is only found after an extended search and trial of many possible choices. Regardless of the path to commitment, the desired result is always to have that certainty about your choice expressed by our customer, "Without question, this is it." Our customer in Jamison, PA used our Rug-Search (tm) service to find a new living room rug to complement their newly purchased sofa and window treatments. They selected a hand-knotted wool and silk oriental rug from us for its elegant but non-traditional look. Their room is small and offered them some challenges in its furnishing due to architectural asymmetries. The 8x10 rug they chose, with light its background and asymmetrical floral patterning, expands the space, and does not introduce additional misaligned axes that would make the room look and feel busy. Our customers in Doylestown, PA used our Rug-Search (tm) service to help them find an 8x10 hand-knotted oriental rug to complete newly installed furnishings in their casual living room. The rug they selected has a relaxed but elegant look that coordinates nicely with all of the colors in their room. The intricate, small-scale, infinitely tiled pattern of the rug does not compete for importance with other elements in the room; and looks and feels at home with its suroundings. Our customer engaged us to use our Rug-Search (tm) service to find a real hand-knotted Persian Kashan rug to provide the quiet foundation to an elegant, but simply decorated, dining room. The rug chosen is of a type sometimes called a "Five Color Kashan", which have been popular in the USA since the 1960's for their limited and subdued palette, intricate detailing, and affordable price-points. (These rugs resemble much more costly Nain rugs for design and color.) This rug is approximately 10 x 13, was produced in Iran, and imported prior to the embargo imposed on importation of Iranian goods in 2011. 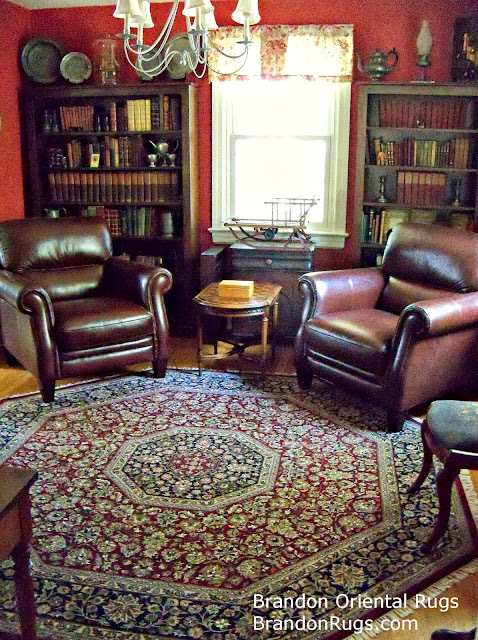 A long-time customer recently purchased a two hundred year old farmhouse in Tinicum Township (Bucks County) outside of Quakertown, PA, and invited us to help her find a rug for the family's breakfast area. The rug she selected is a Pak-Peshawar type hand-crafted as an antique reproduction of a Persian Ferrahan design. 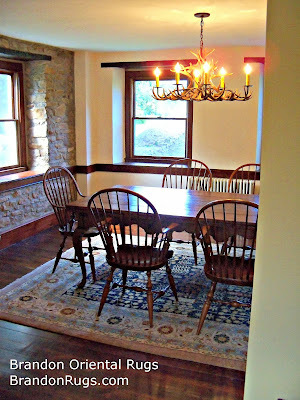 The rug appropriately complements the rusticity of the room and furnishings; capturing the color in the stone walls; providing a nice contrast with the dark, original hardwood floors; and period appropriate in style for the character of the home overall. Our customer in Doylestown, PA asked us to find a rug to complement a hand-painted mural on her dining room walls (done by local decorative artist Carol Nagle). SInce her room is not large, she wanted the rug to provide a sense of expanded volume by coordinating as closely as possible with the colors and character of the mural. 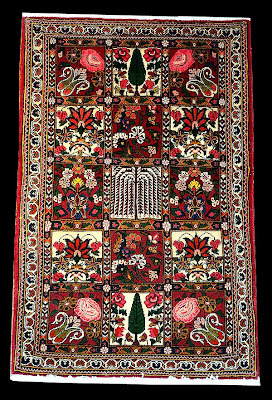 The selection made — satisfying all of her search parameters — is a 9x12 reproduction Oushak design rug made in India. 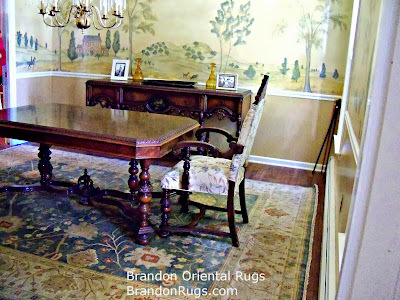 Here's some dramatic evidence of how great rugs can look on your walls. 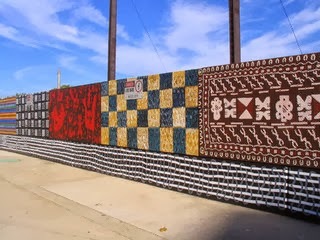 Everyone knows that real handmade rugs are art. So, using them on the walls in lieu of paintings or prints is legitimate, appropriate, justifiable, and not unexpected.